One of the most buzzed-about startups over the last few months has been Codecademy — a site that looks to make programming accessible to just about anyone, with a variety of interactive, web-based courses that have users writing their first lines of code within a few seconds. The site’s ‘Code Year’ program, which invites users to receive one programming lesson each week, racked up a whopping 100,000 signups in only 48 hours — and it even has the White House on board. But, as anyone who has spent much time on the site can attest to, Codecademy has had one big problem: there just aren’t that many lessons available. And the ones that are on there sometimes seem to be moving too quickly, without many practice exercises to explore and reinforce what you’ve just learned. Today, the company is launching a feature that will go a long way toward fixing that. Meet the Codecademy Course Creator. Cofounder Zach Sims says that as soon as Codecademy first launched, the site was inundated by requests from teachers and programmers who were eager to contribute their own lessons. To date that hasn’t been possible — all lessons on Codecademy were written in-house, or by special guest contributors. Starting with today’s launch, which the company is considering a beta, anyone will be able to write their own interactive lessons using the site’s tools (with documentation available explaining how to use them). There’s no approval process involved in publishing a lesson — you write it, and Codecademy will give you a link that you can distribute as you wish. 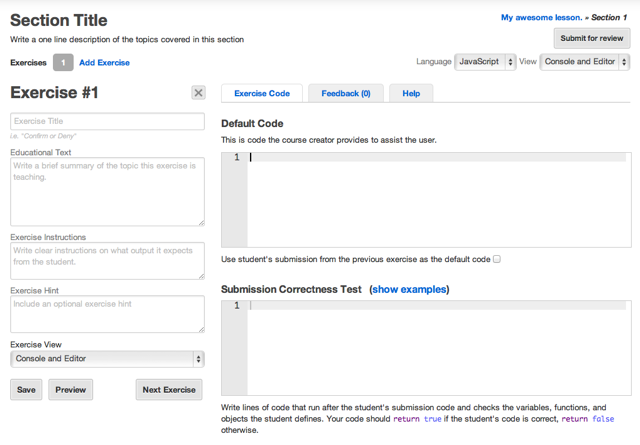 However, there will be a screening process that’ll determine which lessons Codecademy will feature on the site. In other words, users won’t be presented with lessons that aren’t any good, but if you want to create a lesson that’s applicable to a class you’re teaching, or to explain an internal company tool to coworkers, you can use Codecademy’s platform to do it. The site doesn’t have any current plans to pay contributors, but to help incentivize users to write high-quality courses, Codecademy aims to provide significant exposure to the best lesson creators. I also asked Sims if Codecademy has any plans to make the site friendlier to users who have no programming experience — in my use of the site I’ve noticed that there isn’t much hand-holding after the first few lessons, and I’m pretty sure I’d be lost if I hadn’t previously been introduced to these concepts. Sims says that the startup is indeed hoping that these additional lessons will help fill in the gaps, and that Codecademy is also introducing new features to help with this: for example, you’ll now be able to click on certain keywords (like ‘Variable’) to jump to the lesson where that concept was explained, in case you need a refresher. Above all, this is a very important shift for Codecademy. With only six employees, the company would have had to to go on a hiring spree if it wanted to keep up with demand and produce a comprehensive collection of lessons addressing both the basics and more advanced concepts. By turning to the community, it can sidestep that problem — it’ll still have the challenge of identifying the best lessons (and incentivizing the best teachers to write them), but given how much traction the site has already, I suspect it won’t have too hard a time collecting an impressive array of course materials in the coming months.